The specialty coffee scene in Madrid has experienced great growth over the last couple of years. Whereas in 2015, when I visited for the first time, it was still quite intimate with less than a handful cafés serving specialty grade coffee, the number has easily tripled since then. This exciting transition has led to a few changes in Madrid's gastronomic landscape. The residential neighbourhood Chamberí and multicultural Lavapiés have been transformed into coffee destinations. The traditional, local market "Mercado Vallehermoso" in Chamberí has been extended quite recently with a designated area for organic produce, slow food and specialty coffee to accommodate the slow but steady change in consumer's behaviour. Lastly, we see more and more coffee shops who start roasting themselves or developing individual roast profiles together with a befriended roastery. But I am getting ahead of myself, here's a listing of all the great places. HanSo is an incredibly welcoming coffee shop with a communal feel in the young and fashionable neighbourhood of Malasaña. During my stay in Madrid I came back a dozen times for another round of a delicious ‘Tostada con tomate’ (the typical Spanish breakfast) and perfectly balanced cup of coffee. And I was not the only one out to tell the world about HanSo. On my first visit, I ran into the guys from Citinerary.net, a group of passionate locals that roam Madrid for unique stories and latest trends. Listening to them raving about HanSo I knew I was on the right track! Nico opened HanSo together with his wife Eva and younger brother Enrique in October 2015. While Nico is in charge of sourcing only the best beans, his wife is taking care of the dessert cravings of the Malasaña crowd with home-made Matcha cake and other delights. This is not their first attempt to open a place of their own. A couple of years ago they started a bakery and coffee shop in Usera, a neighbourhood in South Madrid. They soon realised that the coffee lovers were elsewhere, so they eventually moved more towards the center. Their café has an urban, contemporary style with a big communal table in the middle of the room as well as cozy seating corners by the window. To keep things interesting, beans are rotating frequently, jumping from a local roastery one month to an international roastery the next. You'll find Right Side and Nomad from Barcelona to be regulars here, while internationally, HanSo have been working with April, Gardelli, Workshop and The Barn. Soon, Kopi will be hitting the grinders as well! Had too much coffee for one day? No problem, HanSo also serves delicious Matcha Latte. Having been the first café to brew and one of the first to roast specialty coffee in Madrid, Toma is no secret! It has been around since 2012 and enjoys the stable reputation of being a hipster hangout in Malasaña. But did you know that in spring 2017 Toma opened up a second location in Chamberí district close to Plaza de Olavide? But I am getting ahead of myself, let me start by telling you about my first Toma experience. When I came to Madrid for the first time in January 2016, Santiago, one of the owners of Toma, welcomed me to their workspace and roastery. I remember the floor was covered in bags filled with green beans, there was a brewing station set up with a La Marzocco on the counter and a PROBAT was twirling golden-brown beans around. The former roaster Nolo was jumping back and forth between notebook and roaster, not leaving the beans out of sight. Also that day, I met Wojtek who was bagging ready-to-brew Toma beans in the famous brown envelopes. He knew a great deal about the Spanish coffee scene and had written an interesting article about Spain's journey to specialty coffee for European Coffee Trip. Unfortunately, you won't find him in Madrid anymore. He has since moved to Berlin to work with the Scandinavian roastery Populus. While I had long mastered the art of drinking coffee, I had never actually worked behind the counter. Thankfully, Toma are also experts in delivering Barista training and gave me a crash course in making espresso. So all good guys, I got my Toma diploma! As far as the coffee shop in Malasaña goes, it is a cozy living room kinda place with a laid back vibe that apart from great coffee serves delicious avocado toast. At the new Chamberí location on the other hand, you'll find an open, ample space with plenty of seating and the right atmosphere to work away on your laptop. When a barista champion and the runner-up of a roasting championship decide to open a coffee shop and roastery together, it must be a recipe for success! Pablo Caballero and Nolo Botana have launched Hola Coffee in March 2017, transforming the Lavapiés neighbourhood into a coffee hub. Their colourful bags can be found in numerous cafés across Spain and the plan to open a second location in Madrid near Plaza de España is already in motion. The first time I met Nolo in 2015 he was still working as a roaster at Toma. In Pablo, who is also a Toma graduate, he found a like-minded Cafecionado who shares his vision and devotion. Together they created a distinct space with lots of love for details and high quality standards. The designer cups by Laon Pottery immediately caught my eye, as did the neon sign with the Hola logo behind the counter. On top of all that eye candy, Nolo served an Ethiopian natural in an espresso that knocked my socks off. For filter the preferred brewing appliance de la casa is Kalita Wave. 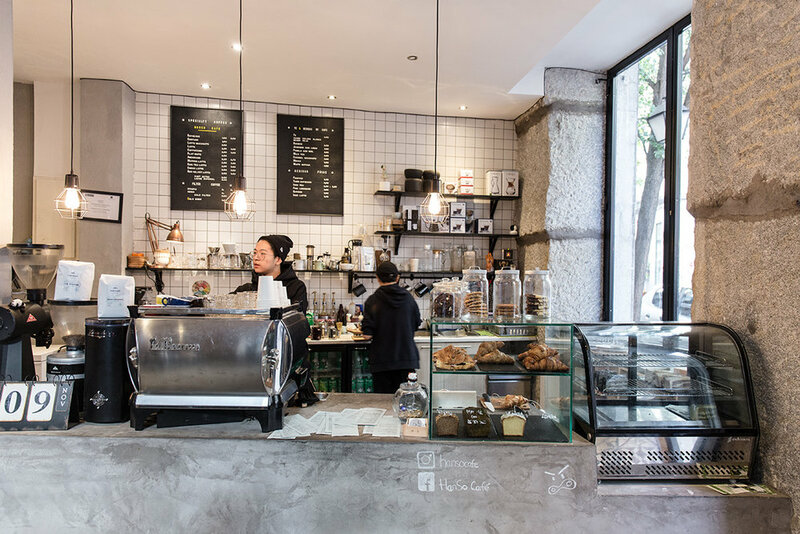 Nolo and Pablo, founders of Hola Coffee, have opened up a second café in Madrid that distinguishes itself from their first project by including a kitchen and bakery as well as table service. Everything is set up for guests to feel comfortable and relaxed. Coffee enthusiasts will be pleased to find the first Mod Bar in Spain installed here. Nolo is particularly excited about the possibilities for pressure profiling that the Mod Bar comes with. Filter coffee is either batch brewed or hand brewed using a Kalita. No need to mention that the coffee beans are roasted by Nolo and are coming from Hola. The drinks menu is extended by homemade Kombucha and seasonal drinks. Come here if with you’re coffee you’d like great customer service, plenty of space and delicious cakes. If you're in the residential neighbourhood of Chamberi, don't miss out on paying Yessika and Javi a visit at lovely Santa Kafeina. The project was born late 2016 but has moved around the corner of its initial location this summer. To prepare for their project, both took part in barista courses across Spain as well as in the UK and collected inspiration for the interior from Instagram and coffee magazines. What Santa Kafeina lacks in space, it makes up for in hospitality. While regulars pop in and out for their daily dose of caffeine, I remain seated for a while to share a new filter roast Yessika was trying from Puchero. For espresso they were brewing Right Side, who continue to impress me, but the guys switch it up every two weeks or so. It's definitely worth it to stop here for coffee at least once when you're in Madrid. Another gem in the Chamberí neighbourhood adding to the flourishing coffee scene north of Chueca is La Colectiva Café. It prides itself on being a place that has space for everyone, whether you want to bring your whole family or just your laptop. It stretches across two floors without compromising cozyness or comfort and is moreover a haven for vegan treats and milk alternatives. The two Argentinian owners Juan Ignacio and Pablo care a great deal about ecological sustainability and quality. My favourite Spanish breakfast, pan con tomate, is prepared with the most delicious and organic olive oil. It goes without saying I ordered two portions! With Puchero by their side all things coffee are well taken care of. On the same day I was visiting, the Duo was awaiting a shipment from Berlin to introduce a new roastery into their repertoire: watch out for Populus Specialty Coffee. Barry Randall was one of the first to roast specialty coffee in Madrid when he started out in 2014. You had to be lucky to find his coffee while cafe-hopping around the city - until the summer 2017, when he found a permanent home in the Mercado Vallehermoso for his first coffee shop. Vallehermoso is a gourmet market in Chamberí that features small producers selling a wide range of ecological and artisanal products on the ground floor of the building. I am telling you guys, Chamberí is the place to be! I came across Randall Coffee Roasters for the first time at Ruda, another specialty coffee shop in Madrid. Barry tells me that for the moment a handful of cafés brew his coffee exclusively, while many others invite him for a certain period. As most coffee shops prefer to rotate roasteries it makes it difficult to estimate how much coffee he should roast. By having his own shop he solved this challenge. The percentage of roasters among specialty coffee shops in Madrid is unusually high, so competition is tough! Barry roasts between 5 and 6 single origins at a time and switches between them in two grinders. You'll also find various brewing methods for filter. I do recommend to come hungry and squeeze in a lunch or aperitiv at the numerous nearby food stalls when you visit. This friendly multi-roaster coffee shop run by Ana Nunez is located in La Latina district - very close to the metro yet in a quiet street. While Cafecionados who are not from Berlin will be excited to find The Barn here, I was more interested in their local roast: a washed Costa Rica Geisha. I ordered it in a flat white, because, why not?! But I also enjoyed it pure as an espresso. Ruda had another local roast for espresso that day from Sumatra. It is a great place to drink yourself through the local and international coffee scene, as the menu is quite extensive, even though its a small shop. For filter there's a V60, Aeropress and Chemex to choose from. Cesar, who was the barista on duty the day I passed by (see picture above) is about to open his own coffee shop close to Plaza de España. Keep an eye out for it! Him and Ruda will continue working together. The theme of the espresso bar is an attempt to combine his two favourite things: coffee and sneakers. Funky footwear is the main decoration here and coupled with gorgeous tiles and red brick walls Coffee and Kicks makes for the perfect relaxing hangout. Be sure to stop by for a 'Tostada con tomate' breakfast, its almost as addictive as the coffee! 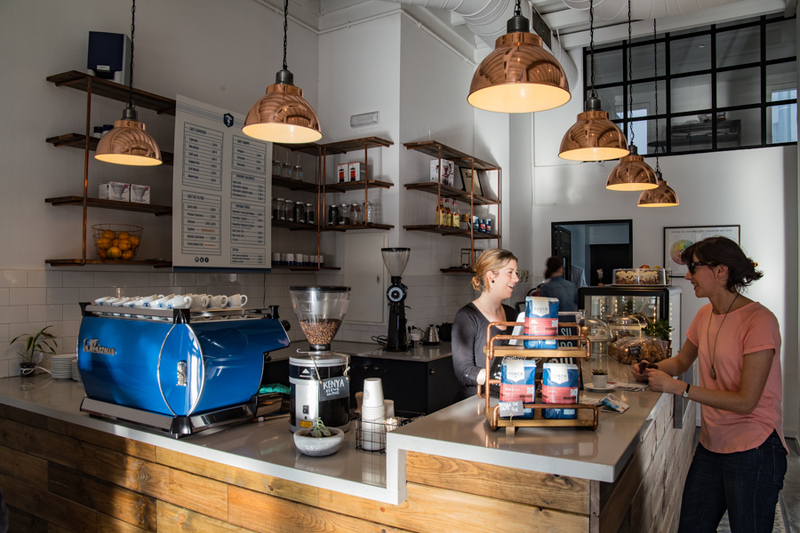 Since spring 2015 Lots Coffee House is brewing high quality take away coffee in Madrid's Castellana neighbourhood. 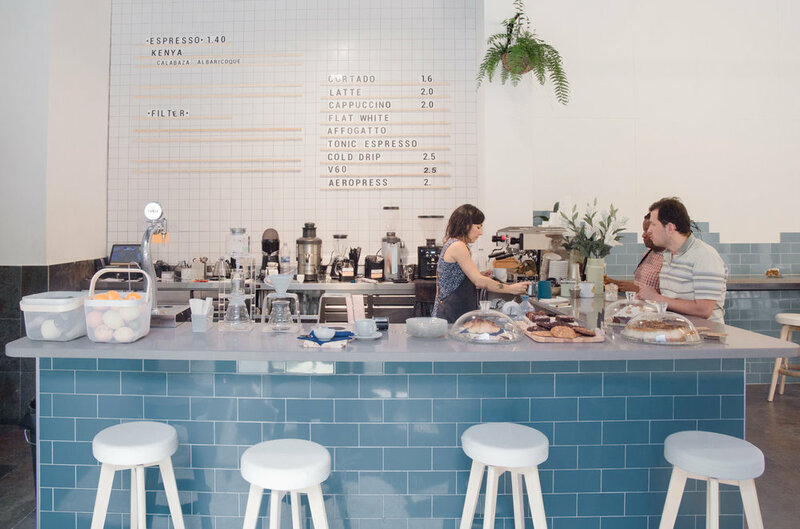 Although it is a tiny space that is not designed for drinking your coffee on site, there is lots to love here - from friendly and skilled baristas behind the counter to top notch coffee. When I dropped by to check it out I ended up having a chat with former barista Daniel Jimenez, who has since moved on to Toma. Back then he gave me some insights into the Spanish coffee culture. "Thirdwave is still slow in Madrid", he told me, but more recently we've seen great progress in the growth of the specialty coffee movement in Spain. Due to his great knowledge he was asked to publish an article about Torrefacto in Spain on the Perfect Daily Grind. It is a great read for all those wondering why most coffee tastes so awfully bitter in cafés across Spain. The coffee is being roasted by the owner Fernando and his father in the province of Madrid in Alcorcón. For espresso based drinks the options available during my visit were from Guatemala and Colombia. For drip coffee the choice was wider, including Kenya, Ethiopia, India and Indonesia. Apart from Aeropress, Chemex and V60 a fascinating brewing method on the menu is the Syphon. Watching the brewing process alone is well worth a trip to Lots! No place to wake up like WAYCUP! Madrids newest specialty coffee shop has been open just a short two months when I visited in November 2017. It's located near Paseo de la Castellana, which is a bit off the beaten track if you're visiting Madrid just for a few days. But the good news is, from Lots it is just a 5 minute walk away, so you can cafehop two places in one go. Before opening WAYCUP, the Ukrainian duo behind the project was running a small coffee kiosk in Nuevos Ministerios. Pavlo and Ruslan (see picture above) have outdone themselves with the opening of their own little café. The interior is incredibly thought-out. Even though the space is limited and not really adapted to lingering for long, there is limited seating by the window and a narrow table at the lower level. WAYCUP collaborates with the roastery Cafè de Finca from Barcelona and features both espresso and filter options. Pavlo and Ruslan choose the varieties they want to serve, have them roasted and later filled in Waycup's own packaging. For pour-over V60 and Chemex are on the menu. Don't go home without trying one of their delicious homemade cookies first! The red velvet with white chocolate chips was a real treat.